4Videosoft iPad Mate combined with five wonderful converter: DVD to iPad Converter, iPad Video Converter, iPad manager, iPad manager for ePub and PDF to ePub maker. It can export media file from PC to iPad, and transfer iPad to iTunes. 4Videosoft iPad Mate also can rip DVD to iPad supporting video/audio formats, and convert all popular videos to iPad. Plus, it supports iPod touch 4, iPad, iPnone 4, iOS 4.2, iTunes 10.1, and iPod Nano 6 now. Rip DVD to iPad supporting video/audio formats, convert popular videos to iPad. ...... Moreover, this iPad Mate has the ability to convert PDF file and finally output an eBook format. Plus, it supports iPod touch 4, iPad, iPnone 4, iOS 4.2, iTunes 10.1, and iPod Nano 6 now. 4Videosoft iPad Mate can import or export movies and music between iPad and your computer without iTunes. 4Videosoft iPod Mate can easily transfer ePub to iPad directly without iTunes. 4Videosoft iPod Mate can also export ePub files from iPad to computer for backup. Support to get iPad compatible video/audio files from DVDs by ripping DVDs to iPad supporting formats. 4Videosoft iPad Mate allows you to convert all popular videos to iPad with high quality and fast speed. FREE synchronizer, synchronize Mac with Pocket PC. Qweas is providing links to 4Videosoft iPad Mate 3.3.28 as a courtesy, and makes no representations regarding 4Videosoft iPad Mate or any other applications or any information related thereto. Any questions, complaints or claims regarding this application 4Videosoft iPad Mate 3.3.28 must be directed to the appropriate software vendor. 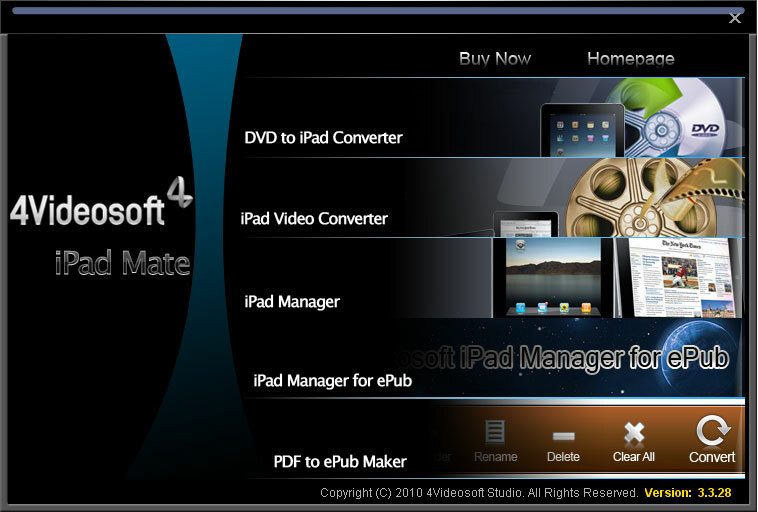 You may click the publisher link of 4Videosoft iPad Mate on the top of this page to get more details about the vendor.